This started life as a Blackfoot 3 kit, with the intention of making it 4WD and possibly 4WS. I then bought a 2nd hand wild dagger? roller for the steering and extra gearboxes. 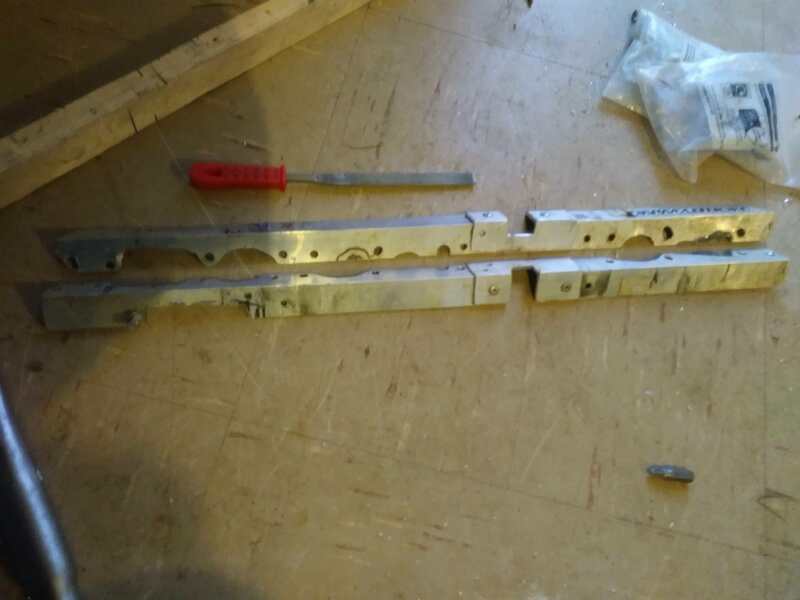 The gearbox and suspension assembly is held to chassis with 4 screws( well 3 so far in this case, lol ) each side, very easy to work on. I could drill straight through and bolt it but haven't yet. It's a bit rough, first attempt at this, still has sharpie marks where I was going to remove more metal, messed up the steering servo, cut the hole too big and had to add the extra plate, not finished it off yet. I have created a weak spot where I cut past the angle to clear the standard shock tower, maybe next time, just cut it off and work round it? I have some very rough sketches of a chassis idea that I had. I did say rough lol,.. I think another gearbox could be added very easily. Took it out for a spin today and it drives quite well. I'd say it's better than it was 4wd. Will try and get video soon. Quite the behemoth! What shell do you have planned for it? Not sure on body yet, it was pretty stable on tarmac Monster truck with flatbed?, school bus? I have started scanning toyshops looking for stuff that might fit. 440mm front centre axle to rear centre axle. I might start again with the chassis and try and make a better one, but this will do for now. I still have another axle to play with, It's a steering axle now as well. Moved the servo about 5mm forward, it was rubbing the gearbox underneath, I did file down the servo saver a bit but wanted to get the measurement better in case there is a version 2. Also trimmed down the mounting plate for the servo, and fitted the carbon shock tower to the rear. I have one for the middle gearbox but couldn't see a way to fit it just yet. I had it out for a full battery pack. I had a 2s 7.4v lipo running the single motor and a 3000mah Ni-mh running 2 motors, this was kind of planned just for testing as there is no lipo cut off yet. Also thinking about strengthening the cut I made for the shock tower...., I think version two will see the plastic shock tower removed, or a provision to fit the carbon tower will have to be made. I have shortened the wheelbase on the first two axles by removing the battery position, it suits the beetle shell quite well and was going to have a plastic V8 covering the other gearbox but Mrs says it looks silly. I know its rough, but the only chassis I could find for these was a single battery carbon fibre affair @$140 not sure if that is even still available. Personally I'd keep the plastic gearbox mouldings uncut for ease of replacement and possible reconfiguration in the future, and add bracing to the chassis at the shock tower cutout. 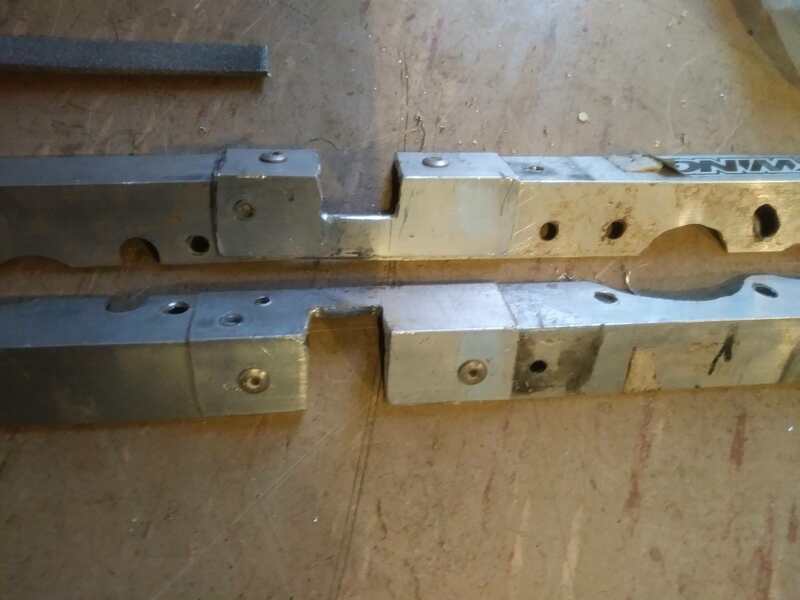 You might also make a bracket to join the lower gearbox mounting points to the bumper of the gearbox in front of it for more strength? As for the shell, how about a larger version of this? You are right on both points, I was going to "tie in" the bottom gearbox mounting point. It's slightly bent, lol, where the cut is for the shock tower, it veers off a bit, must have guessed wrong on some of the mounting holes. Version 2 will hopefully be straight. lol. Tidied up the servo mount a bit, Once I am happy, I will trim down the screws and plate some more for easier removal. This is my new favorite truck and it's not finished yet. I have seen a few of these done on the forums. There should be many more. This is going to be fun. Joined up the bottom gearbox holes, not linked to main chassis yet but more support than before. 6 year old driving, 4 year old singing. me filming, just to show running vid. Hopefully next video will be on board. J turn @ 36sec, it's not easy to get this to slide. The boy did good. He normally has a pistol grip, this tx is a bit big for him. Very cool to see it run. It steers a lot better than I thought it would back when I was trying to talk you into 4 wheel steering. Nice work. 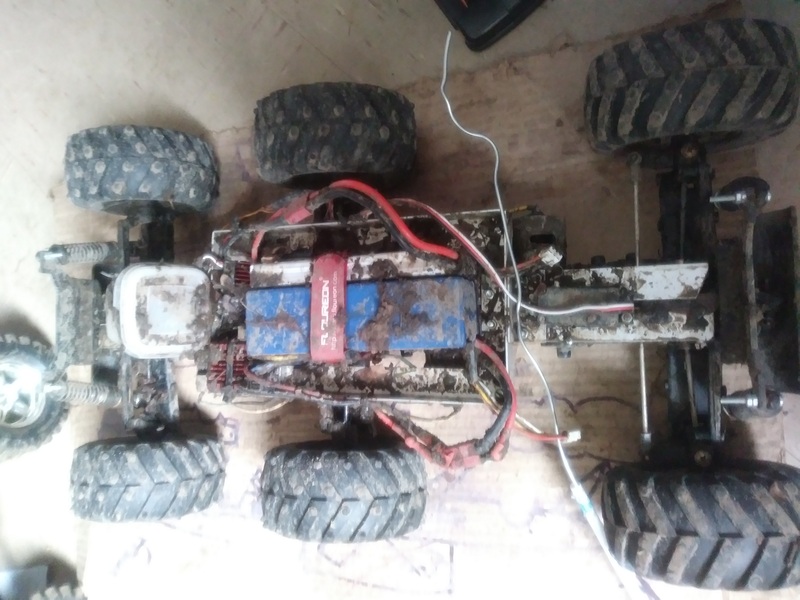 originally had the dual ESC driving the front 2 motors and the single driving the rear, didn't realise ESC was set on boat. lol. Dual ESC now drives rear 2 motors and is set correctly. I'm sure I subbed to this thread, but now see that I was not. For FPV, do you mean First Person View like on a drone? I have the Tactic DroneView. It connects to your cell phone and you use the phone as your monitor. It works, but I am sure there is better. During my testing in the back yard (used it 3 times so far), there is a slight delay from what you see and what the car is actually doing. We were using it to drive around obstacles. When we got to close to the corner of the shed, the truck had already hit the shed before it showed it on the screen. This made it a pain to try to navigate in tight spots or where quick reactions are needed. Video quality isn't that great. It says 720, but IMO, it looks like 480 stretched to fit a 720 screen size. very nice, but the wheels seem a bit far apart. If you're going to redo the chassis is there any option to move the axles closer together ? Hey @MadInventor the first set are closer than they were in the wild dagger, the battery sits inbetween the gearboxes. But yes there is scope for adjustment. Was at the skate ramp today. Going to up the power soon. 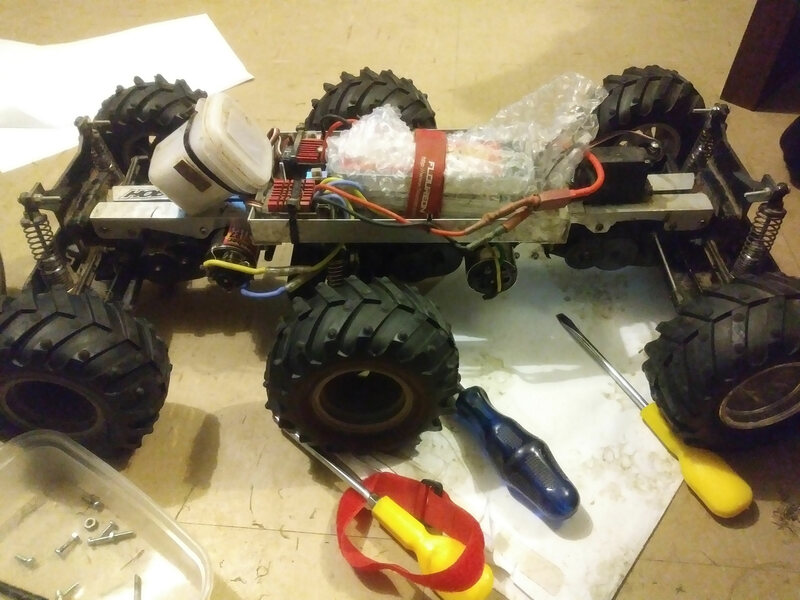 Just rigged up a series connector for twin batteries on rear ESC. Ran it on 4s and 2s. Smoke coming from all silver cans. Lol. Long cut grass wrapped round axles, rear silver can is dead. Pop riveted and superglued double thickness. And back together again. Might avoid the skate ramp in future, and also 4s. Or just do more reinforcements. Lol. Still want to go faster so might just have to go brushless now. Looks good! You don’t want to be avoiding jumps, just make it stronger that skate park looks great fun. You can’t argue at round £30 for the GoolRC brushless ESC & motor combo. I’m assuming you’ll be needing three though? I can’t see your earlier pics to be sure.